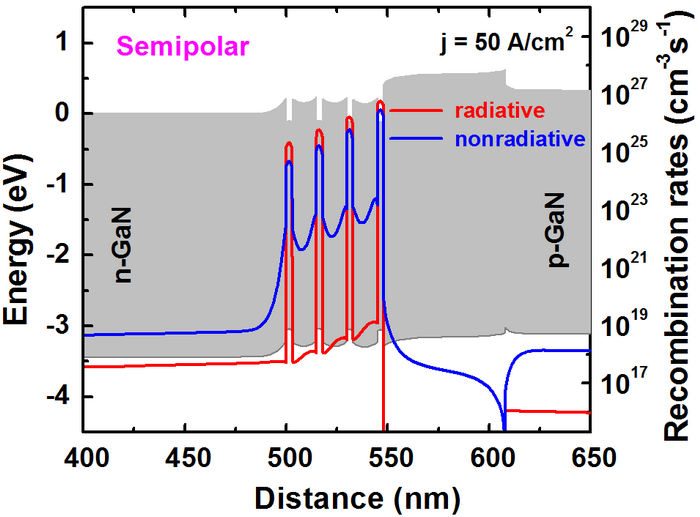 Most of GaN-based optoelectronic structures are grown on the c-plane of the wьrtzite crystal. An important physical property of these nitride structures is the formation of spontaneous and piezoelectric polarization within the heterostructure, that arise because of the crystal lattice mismatch between the layers with the different composition. 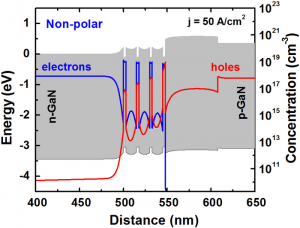 The polarization-related electric fields distort the energy bands, act upon the electron and hole distributions at the interfaces and reduce radiative recombination efficiency. 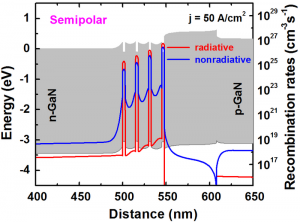 To eliminate the effect of the fixed interfacial or surface polarization charges, the structure grown on alternative crystal planes different from c-plane can be used. For this purpose the structures are grown on the nonpolar facets of the wurtzite crystal and on the planes semipolar ones inclined by ~45° from the c-plane. 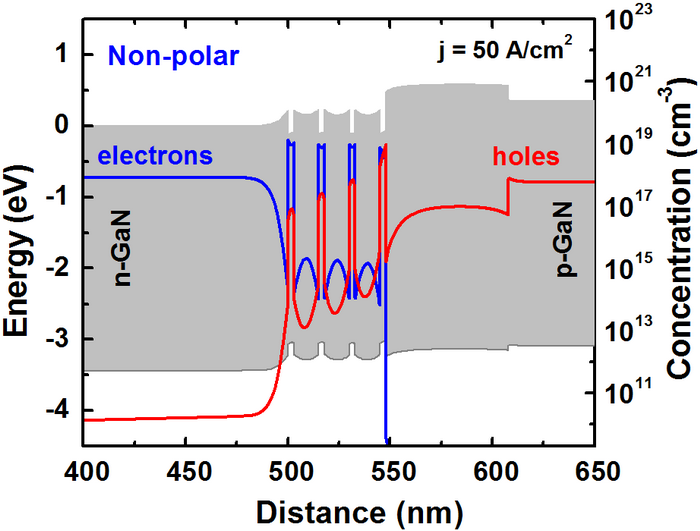 Nonpolar and semipolar structures are characterized by reduced polarization-related electric fields. The energy bands of the structures grown on these orientations are undistorted, quantum wells have more rectangular shape. 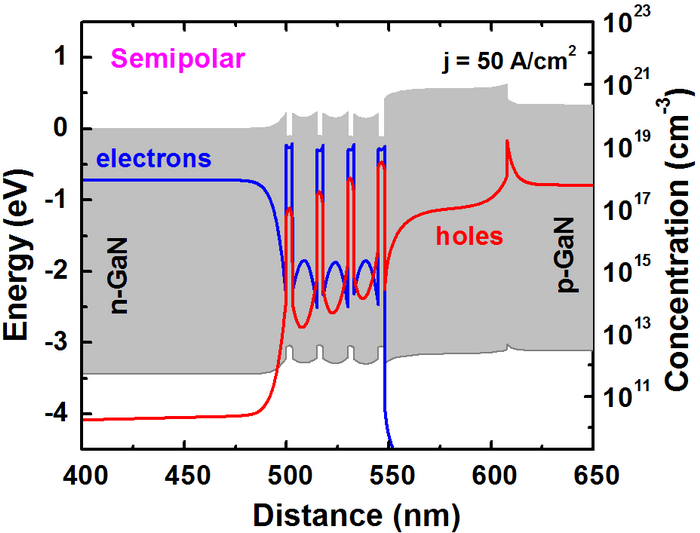 As a result, these structures do not suffer from the separation of the electron and hole wavefunctions typical of c-plane structures. 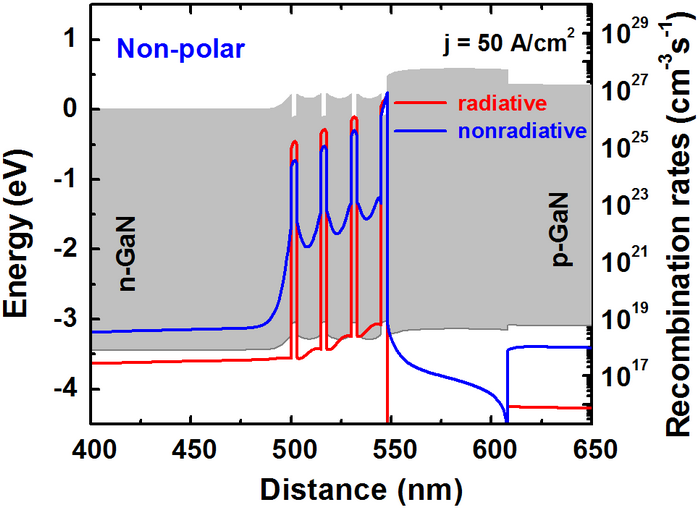 To elucidate the role of crystal polarity in LED operation, we compare the characteristics of the same AlGaN/InGaN/GaN multiple-quantum-well (MQW) heterostructure (see [project file Semi_polar_MQW_structure.sls or Non_polar_MQW_structure.sls] for details) assumed it to be grown on a Ga-faced, a semipolar or a non-polar substrate. Figs.1-6 show the band diagrams of these LEDs computed for the same current density through the diodes. 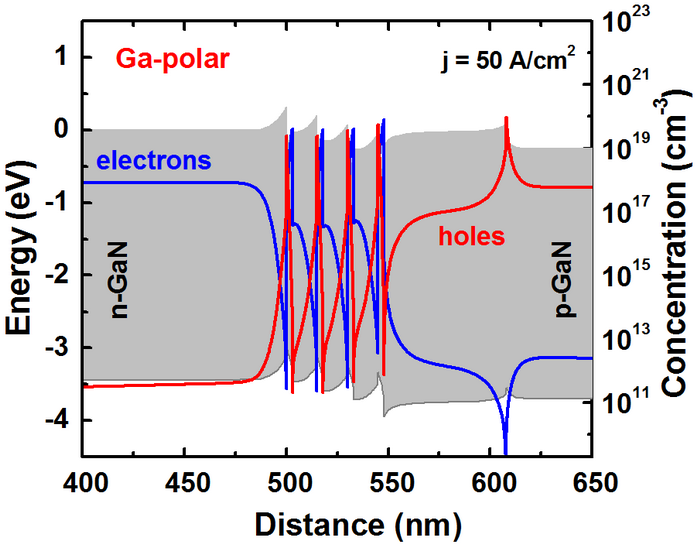 It is seen that in the Ga-faced structure, there is a barrier hindering the electron injection into the MQW active region. 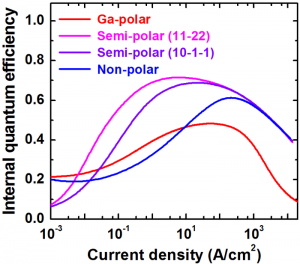 Substantially lower barrier is formed in the non-polar and semi-polar structures, as shown in Figs. 1-3. Furthermore the flat energy bands of non-polar and semi-polar GaN allow for the use of much thicker quantum wells. 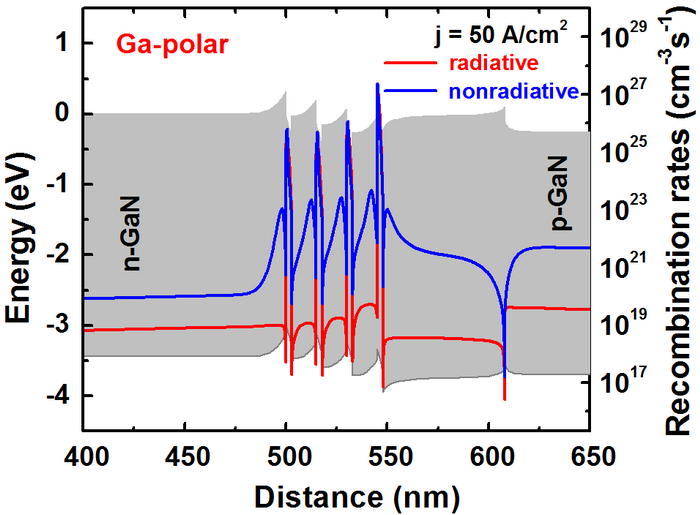 The absence of a built-in electric field in non-polar devices and positive polarization charge at the InGaN/GaN interface, considerably narrowing the space-charge region in n-GaN. 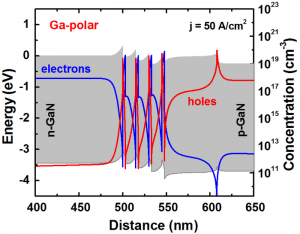 Moreover, there is an excellent confinement of electrons in the alternative oriented structures due to the p-AlGaN and n-GaN barriers preventing the electron leakage from active region. 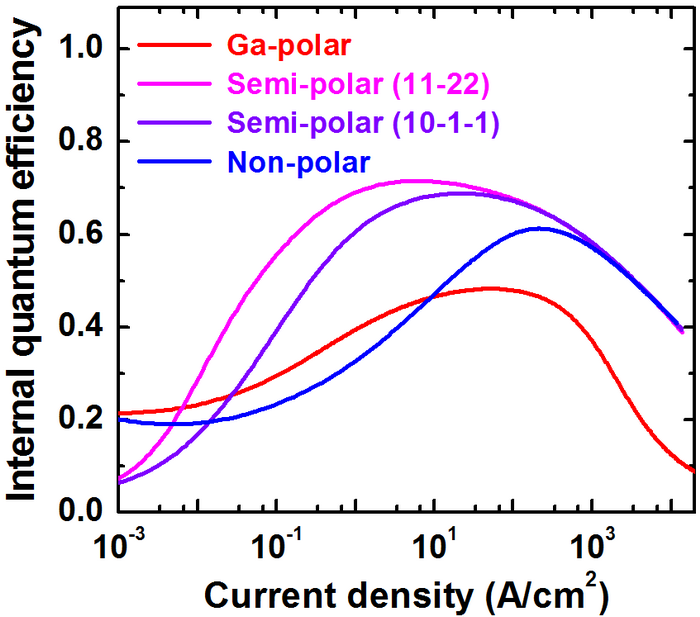 The distributions of charge concentration in quantum wells of the non-polar and semi-polar structures are more homogeneous and recombination is more efficient (Figs. 4-6. 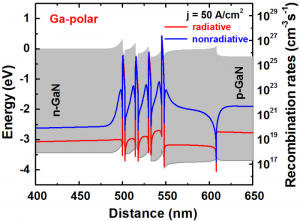 As a result, internal quantum efficiency of these structures is well above the IQE of conventional Ga-faced structure (Fig.7). Some aspects of the choice of the growth surface orientation and detailed analysis of substrate orientation effect on LED operation can be found in the article by V.F. Mymrin, K.A. Bulashevich, N.I. Podolskaya and S.Yu. 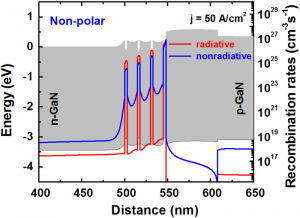 Karpov, “Bandgap engineering of electronic and optoelectronic devices on native AlN and GaN substrates: A modelling insight”, Journal of Crystal Growth Volume 281, Issue 1, 15 July 2005, Pages 115-124.